KTown BCD Tofu House Closes Over the Holidays! It’s only been a little over a month since we penned a love letter to the fantastic soondubu jjigae at BCD Tofu House, so we were shocked to receive a tip that they would be closing down at the end of the year. I called the restaurant just before the new year and was told that they would be closing ‘indefinitely’ for renovations as of December 31st. Turns out the closing is a bit more permanent, according to the photo sent in by tipster Sam K.
This closing certainly raised our eyebrow for a couple of reasons, and could foreshadow a ‘changing of the guards’ in Manhattan’s K-town. They certainly didn’t close for lack of customers – the place was always slammed during lunch, dinner, and well into the late nights. And I highly doubt that they needed to close for renovations, as I’ve never noticed anything wrong with the restaurant’s aesthetics and layout. But my leading suspicion is that they were financially out-maneuvered by some of the newer restauranteurs that have been slowly re-shaping the face of K-town. As rumors would have it, the business owners of some of the newer K-town restaurants have been elbowing out their competition, either through financial means, or sneakier methods such as encouraging building owners to shut down their restaurant tenants to perform ‘renovations’. Whether its a matter of a DOH misunderstanding or a far more nefarious conspiracy, I predict that BCD will not be the only surprise shutter in Korea town this year. 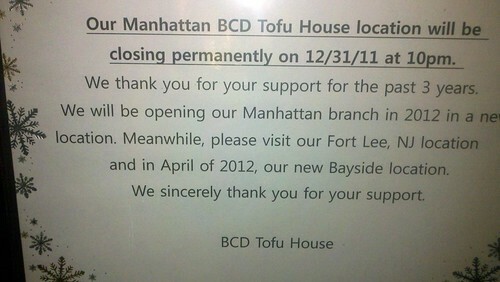 Posted by Chris H. at 8:30 am, January 3rd, 2012 under BCD Tofu House, Closed. whoa! probably the free fried fish banchan put them in the red. Never say such a thing about Woorijip! Perish the thought! Though this loss for Midtown does mean a WIN for Bayside! NE Queens represent! There are plenty of restaurants with a grade of B that are still operating without any pressure to close from the Health Department. BCD has many branches and it would seem highly unlikely that the cause of their closure is a financial reason. From what I have heard, they are simply looking to move to a bigger location. The speculation in the post is highly speculative and misleading.